I'm practically giddy with excitement after having read this. Stephanie from Everyday Family Living "assigned" this book to me at my proposed Facebook Challenge and I wasn't sure if I was going to manage to squeeze it in before the year was out. But behold! It is finished! I'm also giddy because I disliked the book so much that I'm doing a jig because it's over. Now, in saying that, I'm not sure whether or not I should apologize for not liking a book that Stephanie suggested. What she said when she recommended it was that she was curious to see what I would think. She knows me well enough to know that there was a chance I wouldn't like it. The possibility existed!! 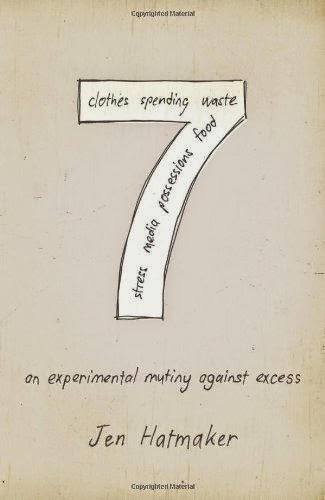 If you are unfamiliar with the premise of 7 , it can be summarized in the subtitle: An Experimental Mutiny Against Excess. Basically it's the documented experiment of Jen Hatmaker to live life more "simply". It's also a loose attempt to convince you to live your own life more simply. I tend to find that suggestion annoying no matter who is making it. I'll tell you why in a second. But to get back to telling you what this book is about: it's about 7 months of Jen Matmaker's life attempts to eliminate excess food, clothing, household goods and social media. It's also about an attempt to grow her own food, eliminate trash waste and, ultimately, develop a deeper relationship with God. In other words, we need to be careful not to re-order our lives according to a set of "homemade rules" that aren't required of us in scripture. We are free to live "simply" or with a bit of "excess" as befits our situation and personal conscience. Trying to convince others to live exactly as we do because it is somehow "right" is actually wrong. Which leads me to my chief complaint about the call among some Christians that we ought to all "live simply". What exactly does that mean? Usually when I hear another Christian make an impassioned plea for others to "live with less" or "be content" or "avoid excess", etc., there is a familiar tone in the voice that I recognize. While I appreciate that people feel passionately about "living simply" I would respectfully request that they remember the above scripture and take care that their passion for simplicity is not evolving into some type of false humility. I suggest that "living simply" is going to mean different things to different people and as Christ didn't lay out any particular example of what a simple home looked like, I think that's ok. Note that there is nothing wrong with trying to live in such a way that frees you up to live the life that God has called you to and for some that might mean not having extra dishes in their cupboards. There is everything right about that. Certainly "things" and "stuff" have a way of stealing our attention from the things in life which really matter. Scripture commands that we remove things from our lives which distract us from our relationship with Christ, primarily. (Mark 9:47; Matthew 19:21 to give a few examples.) We should always be examining the relationships/people/circumstances in our lives and asking God to show us what is distracting us from Him and take appropriate steps to prioritize what is truly important. But to be clear, God doesn't ask all of us to sell literally everything that we own in order to have a relationship with Him. A few may be asked to do so but it would be under pretty remarkable circumstances. (There were, after all, only 12 official apostles who were called to literally follow Him around, leaving behind their lives.) This to say - yes, be aware of what is keeping you from having a right relationship with God. At the same time, I don't think we should be feeling guilty for owning more items that another Christian thinks we ought to own. A third concern that I have about this book is that at the beginning of 7 Jen talks about how each month is set up like a "fast" of sorts. During one of the months she gives up all but 7 ingredients from her diet. For that one month she fasts eating only seven ingredients. Then another month she focused on reduced spending wherein she didn't go out to eat or mindlessly shop. A couple of times friends invited her to go somewhere with them but she'd respond, "Sorry, 7!" as a reminder of her ....fasting project? Experiment? But two things about this lacked in consistency: if the friends then offered to pay for her to eat out, she would go out with them. (So if she is learning to simplify her spending habits but is helping her friends spend money on her behalf I'm very confused. Especially if we're calling it a fast.) She used the words "experiment" and "fasting" interchangeably and when you do that you are presenting two interpretations for what you are saying. If she's experimenting then ok, fine, I get it, she wants to share her experiences. If she's fasting then there is the scripture which tells us that if we fast we should have cheery countenances about ourselves and not make it a matter of public concern or awareness. (Matthew 6:17-18) So which was this? A fast or an experiment? I really don't know that this book should exist. Which is not to say that the conversation should not exist . . . just the book! Jen shares of her experiences in a very conversational manner. If I were conversing with her over a cup of tea or coffee, I wouldn't mind this at all and would have taken a greater interest in what she had to share. However, since she's writing down her thoughts, I felt like she could have taken the time to offer the counter arguments, as well as a lot more scriptural proof and teaching to validate her reasons for making the choices and decisions which she made. Instead it felt like Hatmaker had a whim and a contract to write a book, and why not this idea rather than another? Do we publish books just to publish them? The bottom line to the "simplicity argument" is that I think you must set yourself up in a state that works for you and your family to love God, love His people and serve in whatever form or fashion He asks of you. It's not about reducing, reusing and recycling; it is about a right relationship with God. Eliminate the "stuff" which distracts from this; gather the tools necessary to do your work. I'm going to keep my dishes, still go out to eat with friends when the schedule allows for it, collect good books for my children to read, give good gifts to others (at Christmas time and for no good reason at all) eat healthy, yummy food all of the time (and serve it to others) and enjoy the life which God has given me to enjoy without guilt or apology. I will also do all of the above with thanksgiving, acknowledging that none of my life is remotely possible without God's desire to bestow such wonderful, good gifts upon me. He has made my pathway what it is, just as He has made Hatmaker's pathway what it is. Our lives aren't supposed to look the same. Her "simple" and my "simple" no doubt look drastically different and that's ok. She can be an arm and I'll be a leg in the Body of Christ. I might need more dishes than her and she might need more cowboy boots than me. She has been placed where she is in life "for such a time as this" just as I have been placed where I am for good reason. If we are both simplifying for the sake of relationship with Jesus Christ then it is all good. I think Hatmaker has the best in mind with this book. I took issue with her ambiguous theological arguments in parts, as well as her practical application (stemming mostly from her theology) but I don't fault her for trying to deepen her walk with Christ. That's the most important thing and she shouldn't guilt away from that any more than I intend to. With three sets of dishes or one, I am the Lord's (and the dishes are the Lord's) and amen. I read your review and this (link below) review of The Life Changing Magic of Tidying Up today. I think I'll skip reading 7, but need to read the later. I DO need to work on managing my house well. It is just better for my sanity as a mom. :) And, I totally agree with your take on this subject. Your first couple of paragraphs amused me right off. I haven't read 7 despite having a couple of friends who really appreciated it, because just hearing them talk about it gives me the impression that I'd feel, well, exactly like you do about it. I enjoy project memoirs - but tend to NOT enjoy them when they include any inklings of "you should do this too." Now, I'm all about sharing what you've learned through a project - but suggesting someone else should do the same? Yes! I have not read this book, but I have been hearing talk of simplifying more and more lately, without much definition. I have a couple of friends who are constantly, constantly, constantly going through things to get rid of more things to simplify. We all need to do that sometimes, but for some it seems to be becoming an obsession. Simplifying is a fine idea, but making it an obsession and judging anyone who doesn't do it quite like I do, or who doesn't feel inclined that way at all, is unbalanced. The thinking behind not wanting to spend money on something but it being ok for my friend to spend money on me seems flawed as well. I was just thinking it is ironic that I wrote the above when I wrote on my blog this morning about simplifying Christmas preparations. LOL! But different people have different ways to do that, and, as I said, simplifying itself isn't a bad idea, but any idea is bad when off balance. I know some who have simplified Christmas by not sending Christmas cards any more. But I love sending and receiving them, so to me they are worth the time and a bit of expense (though we "simplified" even that by buying at a discount store at maybe 1/3 to 1/2 less the price of the Christian book store I formerly used). Your opening line about gave me heart failure, which I'm sure was your intent and of course I had to pop in to see what you thought. My hat is off to you since you finished it. I gave up after about the 3rd chapter. Lol!!! Glad you read it. It's been so long since I read it that I don't remember my initial thoughts. I do believe the American church has been given amazing amounts of wealth (I define wealth as having your needs for food, clothing, and shelter meet at the very basic level and then having resources left over.) I also believe that the majority of the American church lives a lifestyle of excess and indulgence. I think Hatmaker was smack in the middle of an excessive lifestyle and her experiment was a reaction to it. What I found disappointing was that she didn't seem to make a lasting change or bring her family into it fully. About two months ago I swapped out my kids' warm weather clothes for winter weather clothes. I commented on Facebook that I had reduced the sets of clothes my boys have. Specifically, I kept only one set of church clothes per boy. (Church clothes being a pair of khakis, white button down shirt, a tie or sweater vest, and a navy blazer.) That's what my boys wear every Sunday. That's all they NEED. You would have thought I had said I only feed them bread and water! I was discussed of having double standards because ellie doesn't have just one church outfit (she wears her dresses and skirts at other times). I was discussed of being judgemental and legalistic. And I was told my boys will rebel against me when they are teens and care what their friends think about their fashion. All of that to say. My observation is that the American church has lived with wealth for so long that they no longer understand needs, wants, convenience, or luxury. I wonder what kind of spiritual blessings we have traded so we can enjoy multiple options. I honestly have no desire to read this book, and I haven't really ever. I have thought maybe I SHOULD read it, since I do live with a good bit of excess. However, much of my excess is in the area of mental/emotional/spiritual riches (i.e. good books, creativity, etc. ), and I honestly feel like these are things God has blessed me with and gifted me with the be a blessing to my family and others. I don't need another project to take on to make me more spiritual, etc.-I need to do with what I already have. I hope this doesn't come off as wrong somehow, or even more, I hope it ISN'T wrong. I don't know. It is for FREEDOM that Christ has made us free. YES. So, here is my review if you're interested. . . I didn't feel like I needed to do what she did, and I didn't feel like I needed to defend my lifestyle. I didn't see her simplifying just for the sake of simplifying (as I agree some people do), but in order to make more room for Jesus--that is, to not be so distracted by the world and stuff that scream for our attention and instead focus on Him. I also remember being struck at her points about how greedy we can be with even our spiritual resources. I can be guilty of being in a weekly ladies' Bible study (with daily homework), having church services three times a week, going to special Bible studies, reading tons of "christian" books and *keeping it all for myself*. It is good to be in the Word, of course, but should I not also be sharing what I'm learning, teaching others, and applying the principles allowing the fruit of the Spirit to pour over into the lives of those around me rather than just gobbling up more, more, more Bible study and discussion? I guess in summary, I didn't read the book as being a judgment of others, but as a prompt for me to examine myself, my appetites, my priorities, and my service. I didn't think it was "the best book ever", but I did find the first half worth pondering.